In 2002, a team of researchers found a skull in the deserts of Central Africa. 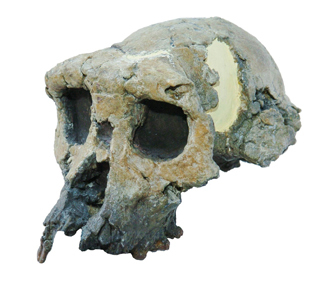 Dubbed "Toumaï," which means "hope of life" in the local language of Chad, the skull was assigned to a new group of hominid, Sahelanthropus tchadensis (see Geotimes, Sept 2002). However, the skull produced controversy over whether it was truly a hominid, and not a species of ape or chimpanzee. Now scientists say they have new evidence confirming that Toumaï is a new hominid species  the oldest known to date. The team, an international and interdisciplinary group known as the Mission Paleoanthropologique Franco-Tchadienne (MPFT), discovered new fossils of jawbones and teeth belonging to S. tchadensis from the same site that produced the skull in Chad. These finds, along with a virtual reconstruction of the Toumaï skull  two separate studies published in the April 7 Nature  help establish what scientists originally thought: Toumaï is a separate species more closely related to humans than to the apes and chimps. "The new material essentially confirms the original diagnosis of the species," says Daniel Lieberman, a professor of biological anthropology at Harvard University and co-author on both papers. "The skull has a huge number of features that resemble hominids, not apes  not only in early hominids, but also in later hominids." This skull, identified as S. tchadensis and found in Chad, is the oldest evidence of hominid evolution, according to new research. Image courtesy of MPFT. The skull is unique because of its age and geographic location, says Michel Brunet from the University of Poitiers in France, an author on both studies and head of MPFT. The bones were located more than 2,000 miles from the Rift Valley where most ancestral human fossils have been found. The location, Brunet says, indicates that the dispersal of the earliest hominids is not localized in a particular region, such as Eastern Africa, as typically thought. Toumaï is approximately 7 million years old, 4 million years older than the famed "Lucy," Brunet says. "This is older than the molecular biologists think of the last split" in the lineage between humans and apes, he says. Previously thought to be about 5 million years ago, humans and apes split from a common ancestor that would have been related to both groups. Based on Toumaï, "now we know that the split between humans and apes is between 7 and 8 million years ago." Scientists reconstructed the skull by scanning it and affixing data points to particular regions to create a virtual replica. "This was a real technological tour de force," says John Fleagle, an anatomist at State University of New York, Stony Brook, who was not affiliated with the research. "You can put bones together and take them apart and you don't have to actually touch the fossil." The Mission Paleoanthropologique Franco-Tchadienne (MPFT), an international, interdisciplinary team of scientists is searching for fossil remains of ancestral humans in Central Africa. Image courtesy of MPFT. The virtual skull was manipulated to resemble the facial features of nonhominid primates to test the possibility that it may be related to some other group, but "it just didn't reconstruct that way," Fleagle says. When trying to make a chimp face out of the Toumaï skull data points, areas of the bones start to overlap and produce gaps in other places. In the case of trying to make a gorilla out of the Toumaï bones, the two sides of the braincase overlap because of a gorilla's smaller brain size, Fleagle says; it is also impossible to elongate the face of the Toumaï skull to replicate a gorilla's snout. Other factors about the skull also indicate that it was more hominid-like than ape-like, Fleagle says. For instance, the jawbones lack a sharpening mechanism notable on apes that have long, pointed canines. Also, the digital reconstruction of the skull shows Toumaï to have a short, flat face, like that of more modern humans, Lieberman says, and unlike Lucy (an Australopithecus afarensis), who had a much longer face. The reconstruction team also says that Toumaï was a biped, walking upright on two legs, based on the position of the opening in the neck for the spinal cord. In most primates, the neck is bent backwards to hold the head upright while walking on all fours. "It's a bit of a stretch," Fleagle says, as they have only found the creature's skull. "You'd like to have legs before you start talking about how it moved." 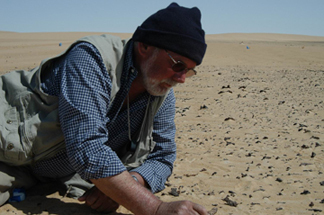 Michel Brunet of the University of Poitiers and head of MPFT, searches the sands of the African desert in search of more evidence of Toumaï. Image courtesy of MPFT. The next step is to find more comparable specimens from the late Miocene, says Brunet, who has already started looking. He would also like the team to start digging into deposits older than those in which Toumaï was found. "What happened in the older level should reveal something more about human evolution," Brunet says, "because Toumaï is not far from the common ancestor." Until more specimens are found, however, scientists will continue to analyze Toumaï, providing more detailed descriptions of the morphological and anatomical features, Fleagle says. "It's a puzzle where this guy fits in," Lieberman says. "It's difficult to figure out evolutionary relationships from the lumps and bumps on bones."